Maximize your pantry space! Our exclusive, top-rated Elfa Door & Wall Rack system makes the most of often-wasted vertical space on a door or wall and is totally customizable! Available only at The Container Store, you love how the six baskets provide storage for spice jars, bottles of oil or vinegar, canned items and other pantry staples. Baskets can be easily repositioned to fit your storage needs, or even removed if you want to take ingredients to another area. Build your own customized solution with our Elfa Utility Door & Wall Rack Planner. White Elfa Utility Wire Kitchen Door & Wall Rack is rated 5.0 out of 5 by 13. Rated 5 out of 5 by WendyWilliams from Awesome Organizer!! I saw this in the store and fell in love with it, my expectations were very high. I ordered on-line, received it a few days later. Installation was super quick and easy. I absolutely LOVE this organizer!!!!! Fit my pantry door perfectly and its so useful for keeping my pantry organized. I would definitely recommend this to everyone. Rated 5 out of 5 by thatbigbaldguy from Changed my “spice” life! Not only had I reached the point where my spices were taking over my pantry but they were lined up so deep that I couldn’t ever quickly put my hands on the spice I was looking for before picking up several others first, even though I organized them alphabetically!! I didn’t want to nail anything into my pantry door and those were the only spice racks I had seen. And then I ventured into the recently opened Container Store in Albuquerque and discovered this! No nailing and I was able to put it together and put it up myself. I’m looking forward to getting another basket or two so that I can make even more room on my pantry shelves. This item has truly changed my spice life and for less than 100 bucks! I am so happy with it! Rated 5 out of 5 by NewToContainerStore from Perfect Over The Door Storage Purchased for inside a pantry door at a new residence that did not permit attaching items to a door using screws or nails. This was a quick easy set up that I was able to do myself. The hook on the top and bottom that comes with this set, is all that is needed to stabilize. It holds a lot of items and nice variety of sizes. I ordered online using the custom order process so I could select the size baskets that met my needs. It would not permit me to order more than 6 per over the door unit despite the fact that I wanted to replace 1 large with 2 small. So I first added a small basket to my cart, then went back to the custom order and selected 2 small, 3 medium, and 1 large. The shelves are removable so can be spaced out as needed. Great design and quality! I could not ask for more. Rated 5 out of 5 by Girlmom from Love being organized and utilizing space I have used the White elfa utility Wire Kitchen Door & Wall Rack for 12 years now. I love it as much today as when I got it. I have also moved in that time and have been able to take it with me and use it in our new house. This system is so versatile and I have changed it over the years. It holds all the small things that get lost in my very small pantry. I love how all my spices are lined up and I can see them so clearly. Rated 5 out of 5 by Anonymous from I use every inch of space in my pantry I was able to use every square inch of space in my pantry with two sets of these wall racks. One fits perfectly behind the door and the other on dead wall space. I store my (alphabetized) spices behind the door and additional seasonings and plastic baggies in the other one. I'm buying a third smaller one for all of my small baking items now. Rated 5 out of 5 by Shryp from Happy Happy Happy I moved into my new home almost a year ago. I haven't been happy since day one with where I was keeping my spices. When I got an email advertising this, it was like a light bulb. Very easy to install, I'm happy and was even inspired to organize the rest of the pantry! Rated 5 out of 5 by Sulli from Pantry door rack I love this pantry door rack. I have all my spices organized at my fingertips. This saves so much space in my pantry. I recently installed this unit for a friend as I was helping her move in her new home. She loved it!! Rated 5 out of 5 by AllyC from Best Over The Door Organizer Ever! 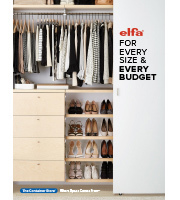 I've bought several door organizers and the elfa by far is the best ever. You don't have to drill any holes, easy to set up, and it stays in place when opening and closing my pantry door. I'm always rearranging and this Organizer is perfect with adjustable shelving. I went to store and bought each item separately since I didn't know how many shelves to buy online. If you don't have a store near by, I'd recommend starting with 4 shelves. In the picture is the narrow line of elfa since my pantry door is so small. Also, I finally have no trouble closing pantry door! You won't be disappointed. Is this anchored near the bottom to keep it from flopping when the door is opened? Is the height adjustable to accomodate different sized dooer? Yes it is anchored at top and bottom. You tighten it at the top with enclosed Allen wrench. No other tools needed. can this rack be mounted directly on the door with screws? Yes, there are holes in the rack for screws. You really don't need them. It anchors to the top and bottom of the door. You would need to provide the screws, not included. How deep is the largest basket? I want to know how much it will bump up against my wall. 4.25 inches from pantry door to end of shelf. However that is for the narrow option! If you have a narrow pantry door, I'd recommend purchasing the narrow elfa shelves. Is there any way I could attach this to the side of my frig? I do not know how this would be possible with the door hooks. You could check with customer service to see if there is an alternative method. I'm thinking of mounting this on a pantry wall instead of the door - is the necessary hardware included? I think you would just use screws in the holes in the vertical strip to attach to the wall, easy! My pantry door is 17.5&quot; wide and 6'11&quot; tall. Will this rack fit? My pantry doors are similarly narrow (double door pantry, see photo). The (small only) standard shelf fits, but it is tight (top shelf in photo). I found at the store there are narrow shelves which are about 13.75&quot; wide and come in medium and large depths (not small), and these work perfectly (bottom 3 shelves in photo). I wanted to order more on line, but don't see them on the website-- will contact the store directly as these are perfect for my narrow (17.25&quot;) pantry doors!! Does the over the door bracket affect the closing of the door (ie. Will the door &ldquo;stick&rdquo;)? I can&rsquo;t stand other cheaper over door solutions that makes opening and closing the pantry or cabinet door more difficult. Does the elfa system do the same? When properly mounted, the Over the Door Hooks of our Elfa Utility Door &amp; Wall Racks do not offer any resistance to your door's functioning thanks to the low-profile design. Will the baskets fit on a 16&quot; wide door? It looks like some of the baskets are 17 1/8&quot;, right? Am I able to buy this system ala cart so I can make sure I get baskets that will fit on my 16&quot; wide doors. I have two 16&quot; doors to my pantry. We'd recommend our Narrow Medium Basket (item # 10032328) and Narrow Large Basket (item # 10047933), both of which are 13-3/4&quot; wide.